It should be noted that Iwata didn’t say Nintendo wouldn’t be present at E3 2013, just that the presentation wouldn’t be as grand as they tend to do at the annual event. This comes after news that Satoru Iwata will be taking over the reigns as CEO of Nintendo of America and could be seen as a head start on targeting the US market. This is something Nintendo really needs to do this year after their sales data for 2013 was released earlier this week and showed that Wii U underperformed in North America. Nintendo bowing out of a major presentation leaves the stage for Sony and Microsoft to go head to head with news of their new consoles. If there is some other strategic edge here is unknown as E3 is usually the stage you want to put your best wares out in a major showcase for everyone to see. It’s the event that generates hype for the holiday season and gives publishers and developers that momentum going in. One conclusion that could be drawn is that Nintendo is looking to promote their titles more directly to the U.S market and more than once which E3 is: one big presentation surrounded by a few smaller ones. On that note, this could be somewhat of a plus since Nintendo’s presentations tend to be pretty dry until they get right to the games and COO Reggie Fils-Aime comes to hype everything. It could also mean that Nintendo has nothing major to present since they got most of the interesting announcements out last week on a Wednesday of all days via Nintendo Direct. 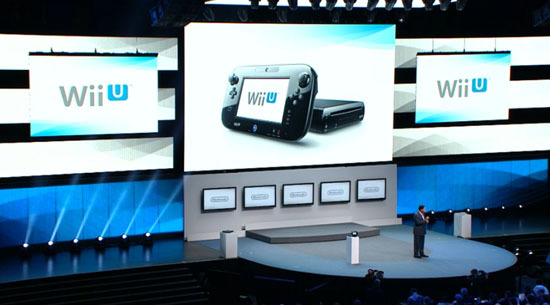 Hopefully Nintendo will return to the big stage at E3 2014 with a major presentation. It’s simply odd not to be present in big match fashion when you’re one of the big three especially after stating a goal of $1 billion to be made in the next year and wanting to move 9 million Wii U’s.